How Can I Lower My Toms? I want to start playing the drums (I recently purchased a new kit), however, the 12" and 13" toms are way too high up and separated for my liking. I can't seem to undo the nuts/bolts to lower the toms and bring them closer together, so I was wondering if I'm missing something? If it IS possible to adjust the toms, I'm wondering if I'm undoing the nuts/bolts the wrong way, because they haven't budged and I've just made marks on my set. 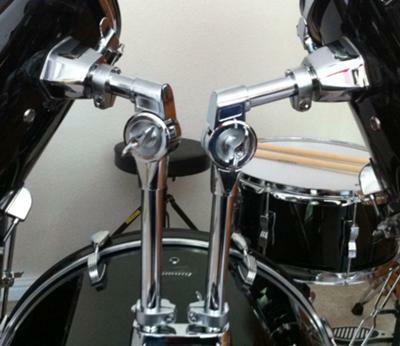 Loosening the fittings at the bottom should allow you to both lower the toms and bring them closer together. The former owner may have used gorilla force to tighten them. Try a little spray of WD-40. That should make the wing nuts easier to turn. Cover your bass drum so you don't get the spray on it. There might also be some guards on the two vertical rods that keep the toms from slipping down. They look a bit like hose clamps. You will need to loosen them also in and then re set them where you want your toms to rest. You can even order custom made drum tabs for ANY song!